The revolutionary F-RIB Folding RIBs have 3-section articulated folding rigid hulls. This makes them much easier to transport and store – taking only slightly more space than an all-fabric boat – whilst retaining the performance, stability and durability advantages of a conventional RIB. That means you can store or transport a “proper RIB” where you thought it was impossible: on the deck of a yacht, or in the back of a car, for example. It may also mean you can choose one a size or two larger than you otherwise would; that means great carrying capacity, comfort and speed. This photo shows that even the 275 has a V shape bottom at the bow, much better than a flat hull if you wish to push on in choppy waters. 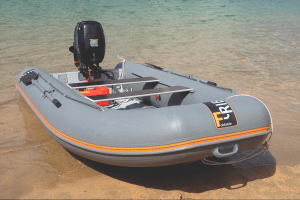 Sailing Today also point out that most sizes of foldable RIB will fit in the back of a car or motorhome etc – impossible with a conventional hard-bottomed RIB. Assembly of the hull is very simple, once you have the technique… just make sure the lugs are engaged with the slots before fully opening. Here you can watch a video showing how to fold the F-RIB 275. 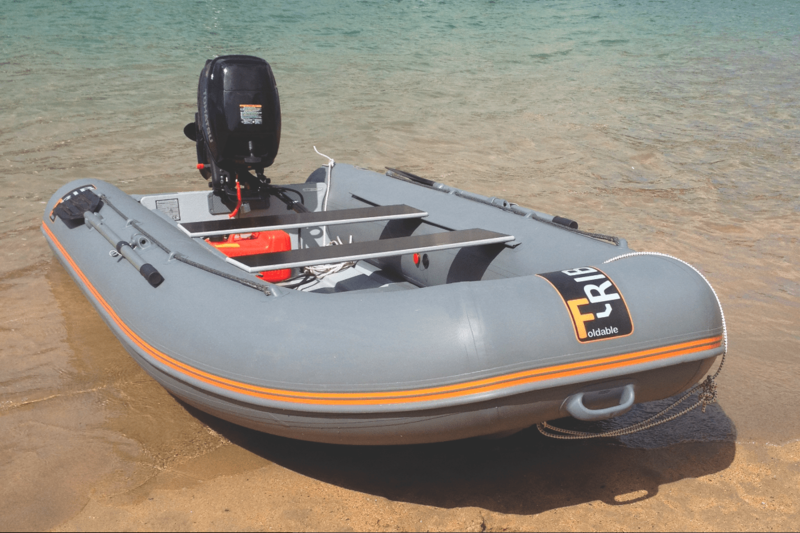 If you are used to a floppy-bottomed inflatable, changing to a hard-bottomed folding RIB will be something of a revolution. At the most basic level, it’s very reassuring to “stand on something solid”. The F-RIB design (ignoring the fact it folds) seems to be unusually stable. And having a solid hull with a defined underwater shape – not dependent on where people sit etc – also makes them better to row. 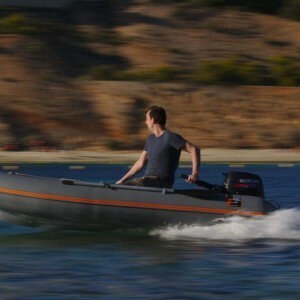 Yachting Monthly tested the F-RIB 275 and found that a Suzuki 2.5 “gave six knots with two adult crew on board, and eight with just one… with a 5hp we made 8 knots two-up and planed at 14 knots with one.” We’ve also tested, ourselves, the 275 with a 9.8hp and, one-up, still had throttle to spare (let’s be honest, chickened out!) at 20 knots. She zipped straight up on the plane and was very smooth and dry at speed, with no sign of movement between the hull sections. With a Torqeedo 1003 (1kW) electric outboard on a 275 we got 5 knots flat out and 4 at half power, giving a realistic range of 8-10 nautical miles (on the 915Wh battery). The 360 (fast action shot above) with 20hp on the back – and the right propeller – can nudge 30 knots with one person on board. And even with four adults on board, nearly 20 knots (in fact we also had a 4 yr old and dog on board too!). A folded F-RIB (Foldable Rigid Inflatable Boat) 275 in the back of a BMW 5-Series estate (wagon), with seat, oars and pump in the blue bag underneath to the left. 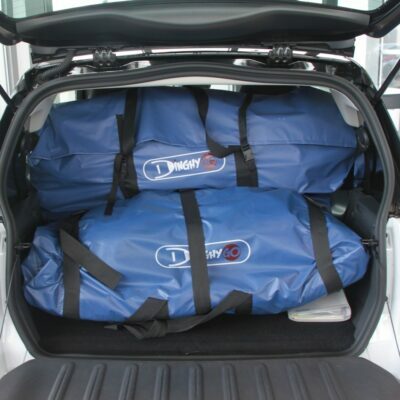 Note that the rear seats are still up and there is still plenty of space for a motor and/or any other luggage you may need to take with you. Similarly the folded hulls will fit in the back of many hatchbacks (eg VW Golf), although in this case you will need to fold the rear seats. – Person Capacity. The F-RIBs are all rated in (RCD) Recreational Craft Directive category C (max wind Force 6, max wave height 2m), which is reassuringly high (or ridiculous, depending on how you look at it, we wouldn’t choose to take a 6m RIB out in that!). If rated in category D (ie for calmer waters) the person capacity would typically increase by 40-50%, so the 275 for example could take at least 4 adults (and does, we’ve tried it, with 5 in fact). – Sailing Versions. 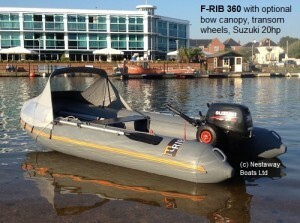 F-RIB have been talking about a sailing version of the 460 and 275 for some time, which we have encouraged. However there is nothing that could be called a “production version”, as yet. 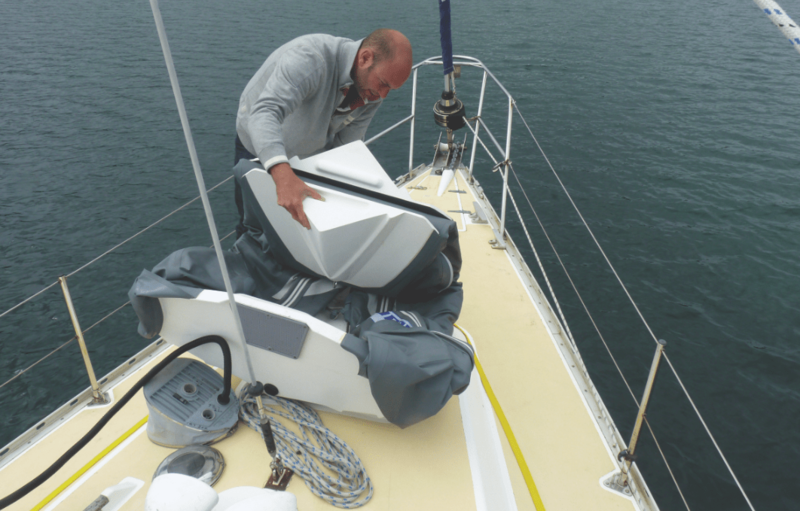 F-RIB Prices include as standard: oars; foot pump; hull and accessory storage bags; repair kit; and removable seat or seats (depending on size). 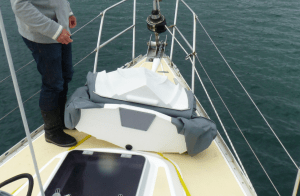 Options include: Bow Canopy (£185 DIY fit see accessory fitting note below); Transom Wheels (£160 also DIY fit): Davit Lifting Points x4 (£120 also DIY fit); Seat Cushions £40 each; Bags that hang underneath seats £30 each; “Comfort pack” – 2 cushions and 1 hanging bag – £99; 12V-powered Electric Pump (£95); UV Tube covers (for Caribbean etc) £185 DIY fit. Accessory Fitting Note: Price for bow canopy, transom wheel, UV tube covers and davit lifting points are for the items supplied loose for you to fit. All are relatively straightforward DIY jobs, but we can do them if you wish us to. However it does take time, and we have overheads and staff to pay for, so we have to charge for it. Fitting charges if you want us to do it are: £65 for transom wheels; £80 for bow canopy; £120 for davit lifting points; £100 for UV tube covers. We are also agents for Torqeedo and Epropulsion electric outboards, and Suzuki and Tohatsu petrol outboards. Our recommended motor will depend on which size F-RIB you choose, what you want to do with it, and of course budget. This is something we’re happy to discuss over the phone or by email, if you want us to supply the motor. At first glance, most people assume a hard-bottomed glassfibre RIB will be very heavy compared to one with a rubber fabric bottom, but with the F-RIBs there really isn’t much difference. Rubber is surprisingly heavy, particularly when you use thick rubber (which is advisable for the bottom of inflatable boats!). 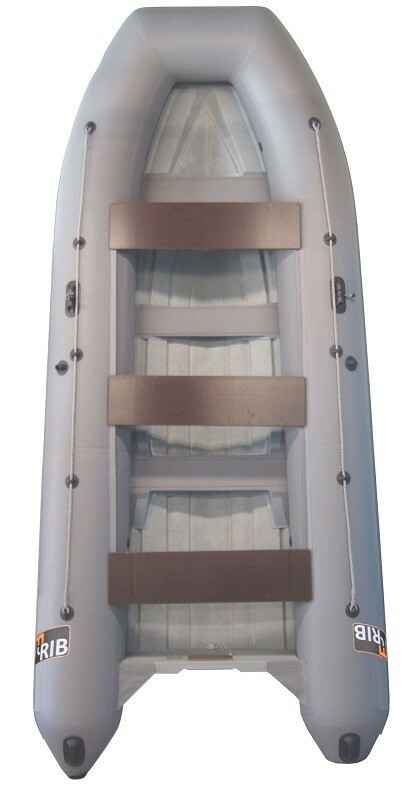 – a typical high pressure floor dinghy with tube keel beneath is 30-35kg. Also bear in mind the F-RIB is a more efficient hull so will either be faster or can take a smaller, lighter engine to achieve the same speed (total weight may therefore be less). – whilst even aluminium-hulled (and non-folding) RIBs, specifically marketed as lightweight, are somewhere between 28 and 45kg. THEY’RE ALL WITHIN A FEW PERCENT. 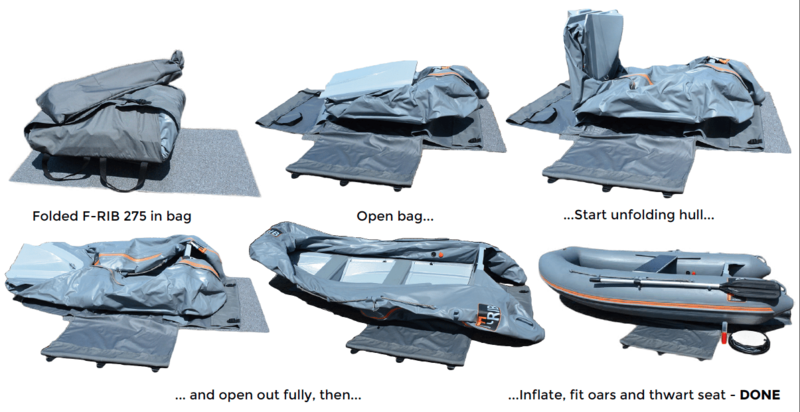 The only way you can really make an inflatable boat much lighter is to reduce the thickness of the fabric, and then you have to question the durability. 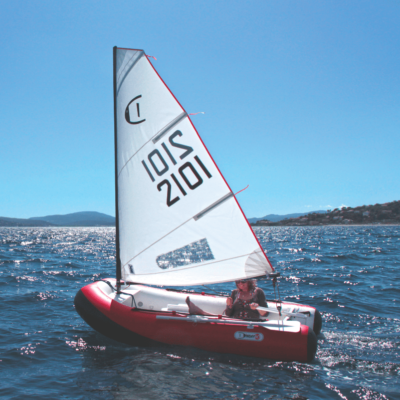 Or buy a smaller dinghy – but that has other implications on factors such as stability, load carrying and performance. 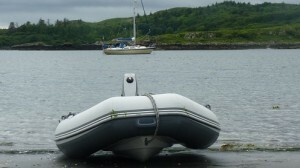 We got hold of our first F-RIB 275 in June 2014 and immediately took it on a week’s trial, as tender to a cruising yacht on the West Coast of Scotland. 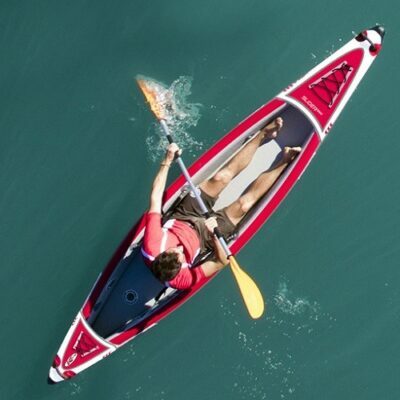 We were deeply impressed, so we decided to add them to our carefully-selected, specialist range of folding boats. Some of our feedback has already been incorporated into the production models in stock now. We then co-launched the F-RIB range at Southampton Boat Show 2014 and gave them a lot of space at London Boat Show 2015. We know for a fact that we have sold more F-RIBs than anyone else in the UK and as you may have noticed most if not all of our photographs are unique to us, because we’ve actually used the boats ourselves (and took a camera!). F-RIB 275 on beach in Scotland. Note underwater bow profile. F-RIB 360 on beach in Salcombe, Tohatsu 20 on transom. Fast, comfortable transport for loads up to 700kg. This model has two bench seats. Folding RIBs make their public debut at Southampton Boat Show 2014. In the foreground, a folded 275 (left) and an inflated 275; in the background an inflated 360. The F-RIB 275, 330, 360 and 375 are all fairly “conventional” RIBs, in terms of performance and handling, apart from the fact they fold up for easier transport and storage. Assembled on the water you would not know they fold up. The 460 is different, longer obviously but also sporting a much more tapered bow and flatter bottom for much of its length, compared with other RIBs. 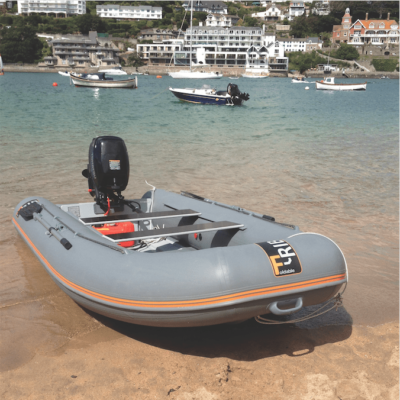 This makes it very fast on flat water – planing is easily achieved with a 3.5hp motor, one-up – but also a slightly “harder” (ie more bouncy) ride in choppy waters. For inland waters it means you will go faster or can use a smaller motor; on the sea you would probably find yourself having to slow down a bit. The new 430 pictured here is more similar to the smaller boats – ie with a conventional RIB hull form – but with a slightly deeper V (better in waves). And biggest difference of all is that the hull is in four pieces rather than three, so it actually folds up to a similar size as the 375! 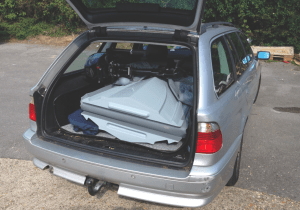 As a 4.3m rigid hull boat it’s really a very capable piece of kit, able to carry up to 6 adults (max 800kg), yet it still fits in the back of an estate car. The only real downside, unless you are extremely strong (and even then…), is the weight – at 68kg it is not really a one person job to assemble/fold.